Happy Monday Everyone! Today I’m excited to have debut author K.A. Reynolds here to share about her MG fantasy THE LAND OF YESTERDAY. It sounds like it has fantastic world building and a story that will really tug at your heart. A tender and fantastical adventure story perfect for fans of Coraline. After Cecelia Dahl’s little brother, Celadon, dies tragically, his soul goes where all souls go: the Land of Yesterday—and Cecelia is left behind in a fractured world without him. Her beloved house’s spirit is crumbling beyond repair, her father is imprisoned by sorrow, and worst of all, her grief-stricken mother abandons the land of the living to follow Celadon into Yesterday. It’s up to Cecelia to put her family back together, even if that means venturing into the dark and forbidden Land of Yesterday on her own. But as Cecilia braves a hot-air balloon commanded by two gnomes, a sea of daisies, and the Planet of Nightmares, it’s clear that even if she finds her family, she might not be able to save them. And if she’s not careful, she might just become a lost soul herself, trapped forever in Yesterday. Hi Natalie, thank you for having me! I’m an expat, born and raised in Winnipeg, MG, now living on an old farm in Maine. I have five kids—all artists and writers—a dog, cats, mice, guinea pigs, and work part time as a home care aid for the elderly. The first time I recall writing creatively was soon after my mother passed away. It was a Shakespearean sonnet about my cat pooping on the dining room table and how I really love cats. *laughsforever* I read and wrote consistently through childhood and well into adulthood to help me cope with abuse, trauma, and pain. As an adult, my poetry had been published in several literary journals and magazines, but it wasn’t until I’d finished having babies that I wrote my first book. Writing has always been a huge part of me, and I can’t imagine my life without it. 2. Where did you get the idea for your story? up. I’d racked up hundreds of rejections, spent so much energy and many tears chasing this dream and had nothing left to give. I found myself in my bedroom one day, literally forehead to floor, ugly crying my little writer’s heart out after all hope had run dry. My dream was dead. It was time to move on. And I swear, not a minute after accepting this fate, the vision of a sad girl in her own bedroom came to me in full color. She had long midnight blue hair and was crying so hard her body had begun turning into paper. I watched as her sorrow spread out all around her until her bedroom started papering, too. I saw Cecelia so clearly, I stopped sobbing, jumped up, ran to the laptop and wrote her story in a great flood of words. Three weeks later, The Land of Yesterday was born. 3. Sorry that your idea came from sadness but great that it came to you so clearly. It sounds like you have created a fantastic world with a hot-air balloon commanded by gnomes, a sea of daisies, and a Planet of Nightmares. Share a bit about your world building process. As a pantser, much of my process is sitting at the laptop, clearing my mind, letting go of fear, and writing. When the words flow, it’s like magic, really. So much so, when I’m drafting, it feels like I’m some invisible entity’s office assistant transcribing the story they’re whispering to me rather than creating it on my own. But when the fancy invisible entity vanishes, and I’m left to my own devices, I find some of my most important world building comes from metaphor. For example. Cecelia’s sorrow = Cecelia cries so hard her body turns into paper, and her sorrow spreads into the world around her. Widdendream, their old Victorian-style home, feels angry and vengeful = its features darken, grow black mold, grow scary-sharp black vines, etc. Cecelia’s doesn’t understand why or how her mother could leave her = Cecelia literally can’t understand the language her teachers and neighbors, and later, the gnomes who taxi her way to Yesterday, are speaking. Cecelia is afraid but wants to be brave = she must visit the planet of nightmares and face her fears. I use metaphors a lot to convey a visual path to understanding where sometimes words are not enough. 4. That's great how you use metaphors in world building. You are also a poet and your prose has been described as beautiful. How did your poetry writing influence your writing of this story? When I’m writing, I hear the beats of words like music and work them until they flow just right. I use the cut of a line and the way paragraphs come to a page to emphasize sound, meaning, and feeling. And I do love a good old-fashioned swoony string of words. But poetry isn’t just about pretty words and structure. It’s a way to explore the human experience through figurative language. To feel and be felt. To understand and be understood. To know your heart. Oftentimes, poetry is more about what isn’t written, rather than what is: an invisible question passed to the reader to answer for themselves. As to whether my background in poetry influenced The Land of Yesterday, I think it must have. I wrote this book with my heart; it’s the only way I know how to write. 5. Like Cecelia in your story, you have suffered a great loss as a child. Did you draw on your own emotions in telling Cecelia’s story? Oh, most definitely. Drawing from my own experience is the best tool in my writer’s toolbox. Those emotions are evergreen, honest, real. They are sometimes very difficult to write or talk about, to slice open those old wounds. But it’s the sharing of these stories that connects us, brings us together, and breeds empathy. Grief is one of those stark realities that finds us all. I wanted to do it justice by giving it everything, so digging deep into my own grief was essential. 6. So true about grief. It sounds like your story is a real heartbreaker as well as being a riveting story. How did you get the balance right between the emotional growth of Cecelia and the plot-driven story that is necessary for a fantasy story? First answer: I had a lot of help! I went through several revisions of this book and it went before many eyes. My CP’s, beta readers, agent, and editor helped guide me to where I needed to be to find the right balance. I’m the first to admit, for me, plot takes some doing. I’m much more emotional arc oriented, but I’ve learned how to draw on that strength to forward plot. When I draft, I listen to that invisible entity and type away, trying not to deviate too much from the voices in my head. When I’m finished, not all the story is there, but all the building blocks are. I draw off either plot or emotions (whatever is lacking) and ask myself questions to bring the hidden words to the surface. Cecelia’s haunted house wants to kill her; if a haunted house wanted to kill me, how would I feel? Cecelia is overcome with sadness; what’s a good metaphor for sadness to help me further the plot: her body turning into paper. Play to your strengths, ask yourself questions, and get as many trusted eyes on your book as possible. 7. Your agent is Thao Le. What was your road to obtaining an agent and book contract like? Oy. It was dark and beautiful and threatening, filled with jugs of wine, kindred souls, and ghosts. But seriously, the road seemed never-ending at times. 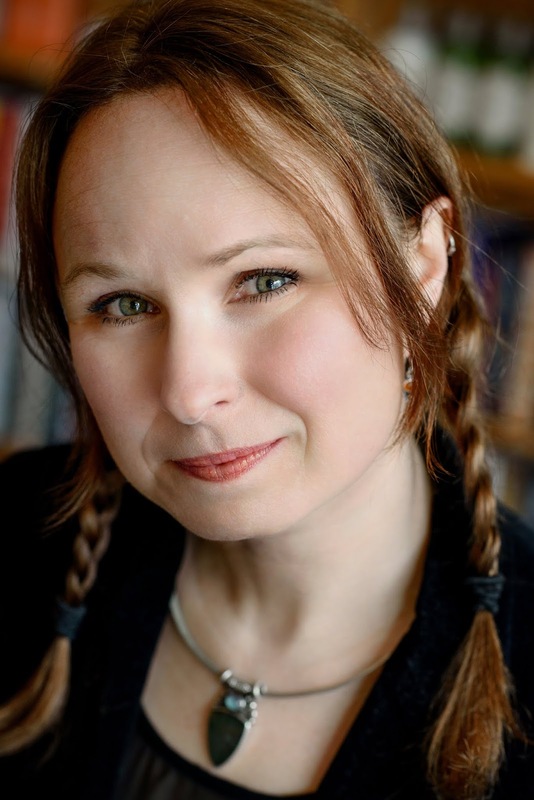 I’d been searching for an agent for almost five years, on four different books—adult and YA. I got very close. Won contests. Was a mentee two years in a row in Pitch Wars, etc. I’d been told, “Your writing is so beautiful, but . . .” And, “I love this concept, but . . .” so many times, but no agent loved them enough. Until I wrote this book. Then, I for four R&R’s. Did them—reluctantly—and got a second R&R from Thao! She really got my story and loved it from the beginning. The next revision for her was smaller. I did it with a hammering heart and sent it off! She emailed not long after and asked for a phone call!!! When Thao offered, after five years of ridiculously early mornings and all-day writing and tears and work, the walls of my house were thumping with joy. I got two more offers, but I knew from the start that Thao was The One. Thao and I did two more small revisions I think before going on sub. But once it went out, we had an offer in two weeks. From HarperCollins. By a dream editor. 😊 I. Was. Floored. The road was long and hard and dark, my shoes were threadbare, and clothes torn, but when I got to the end it was all worth it. None of those years spent writing and failing were failures. They were school. They were learning what I needed to succeed and get to where I am now. 8. Glad you had a happy experience once you got your agent and publisher. How are you planning to promote your book? What advice do you have for the rest of us on developing our social platform and marketing our first book? I’ve been doing giveaways, talking it up on social media, sending to book groups of teachers and librarians to read, share, and review. I made SWAG, am doing a pre-order giveaway, and joining other debut authors for group activities to promote our books. I’m also hoping to do some panels and attend some cons if possible, too. I’ve been on social media for years and it’s been such a great tool. Twitter especially, but I also love Instagram. As far as advice? I’d say the best advice I can give is reach out to other writers. Make friends. Talk about the books you love and why. 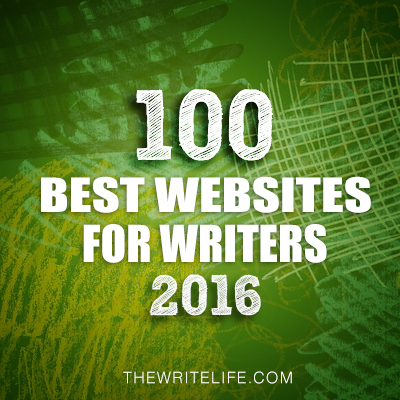 Don’t be afraid to tell your favorite authors how you admire them or love their work. And, just have fun! I’m still learning about marketing, but my best advice here is: do whatever you can do and don’t stress about what you can’t. I have a lot of limitations on this end and I’ve had to learn to let some things go and not to beat myself up over it. Do what you can, play to your strengths, and try to enjoy this amazing time in your career. 9. Great advice! It might even help me get over my marketing phobia. What is something that surprised you about being a debut author? That writing my contracted book two would be like trying to run a marathon on hot lava with an elephant on my back while the sky is melting and I have to pee really, really badly. *laughs/cries* I’d written books before, so why was this So Hard?!? It is still something of a mystery. But from talking to my debut group, where we have a separate group called Book 2: Trips on the Strugglebus, I know I’m not alone. My second MG fantasy, THE SPINNER OF DREAMS. This fairytale-ish story revolves around Annalise Meriwether, a girl with anxiety, panic disorder, and OCD, who must find the courage to battle the Fate Spinner inside an enchanted labyrinth for a chance at making her greatest dreams come true. This was a hard book to write and took two years to finish. At times, I wanted to give up. Thought it was trash. Thought I was a hack. That I couldn’t write it the way I envisioned it in my head. I was anxious and panicked and stressed more than ever, because living with mental illness and writing about it was . . . a lot. But, I wouldn’t let myself quit. Mental illness in middle grade is rarely explored, even less so when the main character is the one with the illness, yet it occurs more often in real life than many might think. As a child living with these mental illnesses, I’d have loved a book with a main character whose mind and body worked like mine. A book filled with magic that gave no magical cure for my mental and physical challenges, but showed me that I could still be strong, was still brave, and that I was magical and lovable, not despite my challenges, but because of them. But, Annalise is the sweetest character I’ve ever written. I fell in love with her, and hope others will, too. I’m also drafting a secret project that is so different from my last two but has a voice I really love and am really excited about! And I have ¾ of another MG Fantasy written that I can’t wait to dive back into! 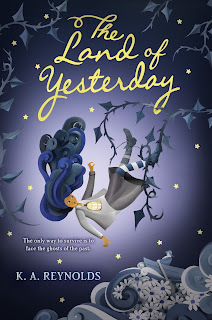 Kristin has generously offered an ARC of THE LAND OF YESTERDAY for a giveaway. To enter, all you need to do is be a follower (just click the follow button if you’re not a follower) and leave a comment through August 4th. If your e-mail is not on your Google Profile, you must leave it in the comments to enter the contest. If you mention this contest on Twitter, Facebook, or your blog, mention this in the comments and I'll give you an extra entry. You must be 13 years old or older to enter. The giveaway is U.S. and Canada. Hope to see you on Wednesday, August 1st! The best writing and characters come from pain sometimes. If we feel it that strongly, so will the readers. Congrats on sticking it out and finding success, Kristin. This book sounds like a great cross between a more emotional MG book and a fantasy one. It's also fun to learn about how authors worldbuild! Thank you! I love world-building! Great interview. I think we all cry on the floor at some point in our writing journey. The story sounds wonderfully heartfelt with such an interesting plot. 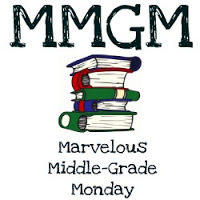 Thanks for sharing in today's MMGM line-up. Preach, Greg! On the floor is the best place to find lost inspiration. :) Thank you! This book sound fantastic!!!!! Love it. Oh, goodness, I love this cover! The book sounds lush and gorgeous, too! Perhaps a little sad for me, but sad can be good. :) Thanks for the wonderful interview, as well! I have some very painful poems yet great poems about my family. Really enjoyed your post Natalie. Congratulations, Kristin! I'm a pantser too, so I loved hearing that you are. Three cheers for pantsers. And thank you! What a engaging and thrilling read! Kristin, I loved your sharing your personal writing journey. I love your persistence and determination. Sometimes failing clears everything away so that we are open to something new! Love you story. I am always looking for books for youth about mental health issues. Like how The Land of Yesterday is fantasy, with a good dose of realism! Congratulations Kristin. Best of luck on The Land of Yesterday's success. I love the cover!! I also love how this story idea came to Kristen in a moment she thought her writing journey was over. Wonderful interview ladies!! Thank you so much for your support, Holly!!! Left to your own devices sure is the way. Just go to it and see what comes due. I love this interview! It would be great to share with my students. Good luck to future books and can’t wait to read this one! Thank you so much! I hope your students enjoy it! What a great story of how persistence can pay off. Wishing KA the best on her new release. What a great interview. It gives us all hope. This book sounds terrific. I don't usually read fantasy, but I want to read this book. Thanks for the post. Thank you so much, Rosi! This book sounds exactly what my middle school Book Club kids would love to read. This makes me so happy, thank you so much!!! What a beautiful, beautiful story, Kristin. Congratulations. I just added it to my reading list. Thanks for a wonderful interview, ladies. I love the cover! Wishing Kristin all the best. Great interview. :) I look forward to reading The Land of Yesterday! This story sounds lovely! Thanks for the giveaway. I'm so glad you hung in there, Kristen. Your stories sound wonderful. I'm so happy for you. This book sounds fantastic! Thanks for doing the giveaway!